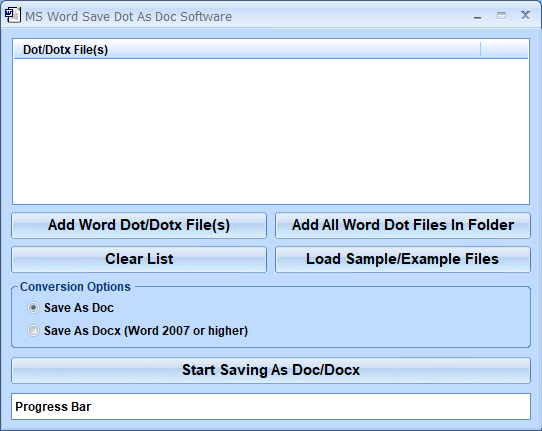 MS Word Save Dot As Doc Software offers a solution to users who want to manipulate Document Template (.DOT or .DOTX) documents. Simply drag and drop your files into the easy to use interface and chose whether to convert to .DOC or .DOCX. This automation software will save you time because it can handle large batches of files. Click to convert and each file is saved to the folder of the original. Word 2000 or higher required. MS Word Save Dot As Doc Software is backed by a 30-day money back guarantee. If you are unhappy with the product, simply fill out the electronic form for a refund.